Nebulae from which the ﬁrst-generation stars formed consisted entirely of the lightest atoms, because only these atoms were generated by Big Bang nucleosynthesis. In contrast, the Universe of today contains 92 naturally occurring elements. Where did the other 87 elements come from? In other words, how did elements with larger atomic numbers (such as carbon, sulphur, silicon, iron, gold, and uranium), which are common on Earth, form? Physicists have shown that these elements form during the life cycle of stars, by the process of stellar nucleosynthesis. Because of stellar nucleosynthesis, we can consider stars to be “element factories,” constantly fashioning larger atoms out of smaller atoms. What happens to the atoms formed in stars? Some escape into space during the star’s lifetime, simply by moving fast enough to overcome the star’s gravitational pull. The stream of atoms emitted from a star during its lifetime is a stellar wind (figure above a). Some escape only when a star dies. 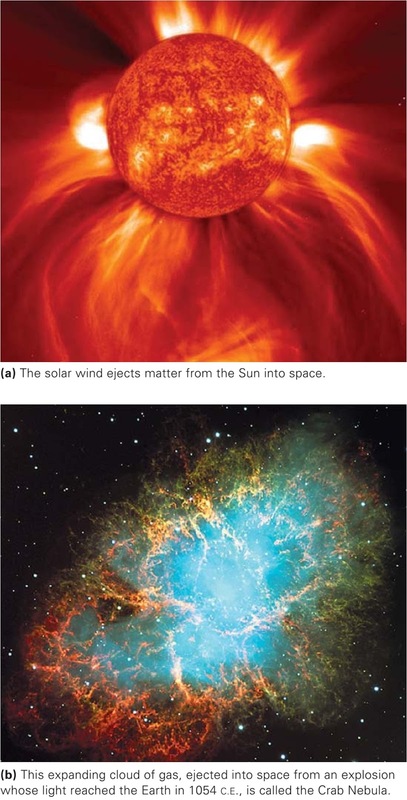 A small or medium star (like our Sun) releases a large shell of gas as it dies, ballooning into a “red giant” during the process, whereas a large star blasts matter into space during a supernova explosion (figure above b). Most very heavy atoms (those with atomic numbers greater than that of iron) require even more violent circumstances to form than generally occurs within a star. In fact, most very heavy atoms form during a supernova explosion. Once ejected into space, atoms from stars and supernova explosions form new nebulae or mix back into existing nebulae. We stand on a planet, in orbit around a star, speeding through space on the arm of a galaxy. Beyond our galaxy lie hundreds of billions of other galaxies. Where did all this “stuff” the matter of the Universe come from, and when did it ﬁrst form? For most of human history, a scientiﬁc solution to these questions seemed intractable. But in the 1920s, unexpected observations about the nature of light from distant galaxies set astronomers on a path of discovery that ultimately led to a model of Universe formation known as the Big Bang theory. To explain these observations, we must ﬁrst introduce an important phenomenon called the Doppler effect. We then show how this understanding leads to the recognition that the Universe is expanding, and ﬁnally, to the conclusion that this expansion began during the Big Bang, 13.7 billion years ago. Contrasting views of the universe drawn by artist hundreds of years ago. Think about the mysterious spectacle of a clear night sky. What objects are up there? How big are they? How far away are they? How do they move? How are they arranged? In addressing such questions, ancient philosophers ﬁrst distinguished between stars (points of light whose locations relative to each other are ﬁxed) and planets (tiny spots of light that move relative to the backdrop of stars). Over the centuries, two schools of thought developed concerning how to explain the conﬁguration of stars and planets, and their relationships to the Earth, Sun, and Moon. 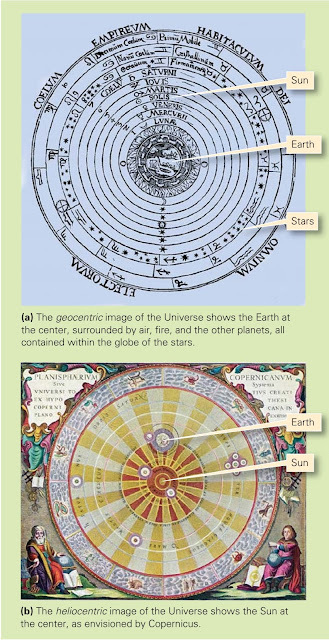 The ﬁrst school advocated a geocentric model (figure above a), in which the Earth sat without moving at the centre of the Universe, while the Moon and the planets whirled around it within a revolving globe of stars. The second school advocated a heliocentric model (figure above b), in which the Sun lay at the centre of the Universe, with the Earth and other planets orbiting around it. The popular media commonly portray deserts as endless vistas of sand, punctuated by the occasional palm-studded oasis. In reality, not all desert landscapes are buried by sand. Some deserts are vast, rocky plains; others sport a stubble of cacti and other hardy desert plants; and still others display intricate rock formations that look like medieval castles. Explorers of the Sahara, for example, traditionally distinguished among hamada (barren, rocky highlands), reg (vast, stony plains), and erg (sand seas in which large dunes form). In this post, we’ll see how the erosional and depositional processes described above lead to the formation of such contrasting landscapes. We've seen that erosion relentlessly eats away at bedrock and sediment in deserts. Where does the debris go? Below, we examine the various desert settings in which sediment accumulates. Production and transportation of debris and sediment in deserts. Over time, joint-bounded blocks of rock break off ledges and cliffs on the sides of hills. Under the inﬂuence of gravity, the resulting debris tumbles downslope and accumulates as talus, a pile of debris at the base of a hill. 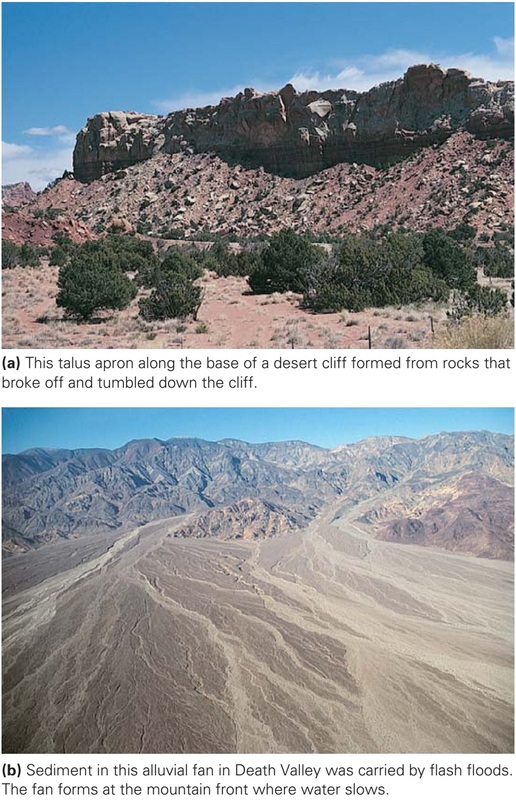 Talus can survive for a long time in desert climates, so we typically see aprons of talus fringing the bases of cliffs in deserts (figure above a). Formally deﬁned, a desert is a region that is so arid (dry) that it supports vegetation on no more than 15% of its surface. In general, desert conditions exist where less than 25 cm of rain falls per year, on average. Because of the lack of water, deserts contain no permanent streams, except for those that bring water in from temperate regions elsewhere. Note that the definition of a desert depends on a region’s aridity, not on its temperature. Geologists, therefore, distinguish between cold deserts, where temperatures generally stay below about 20C for the year, and hot deserts, where summer daytime temperatures exceed 35C. Cold deserts exist at high latitudes where the Sun’s rays strike the Earth obliquely and thus don’t provide much energy, at high elevations where the air is too thin to hold much heat, or in lands adjacent to cold oceans, where the cold water absorbs heat from the air above. 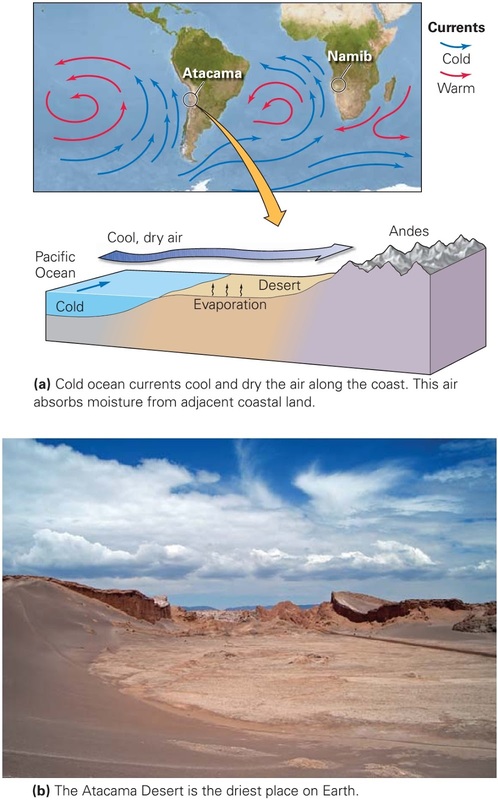 Hot deserts develop at low latitudes where the Sun’s rays strike the desert at a high angle, at low elevations where dense air can hold a lot of heat, and in regions distant from the cooling effect of cold ocean currents. The hottest recorded temperatures on Earth occur in low-latitude, low-elevation deserts 58C (136F) in Libya and 57C (133F) in Death Valley, California. Each desert on Earth has unique characteristics of landscape and vegetation that distinguish it from others. Geologists group deserts into ﬁve different classes, based on the environment in which the desert forms (figure below). Subtropical deserts form because the air that convectively flows downward in the subtropics warms and absorbs water as it sinks. Subtropical deserts: Subtropical deserts (such as the Sahara, Arabian, Kalahari, and Australian) form because of the regional pattern of air circulation in the atmosphere. At the equator, the air becomes warm and humid, for sunlight is intense and water rapidly evaporates from the ocean. The hot, moisture-laden air rises to great heights above the equator. As this air rises, it expands and cools, and can no longer hold so much moisture. Water condenses and falls in downpours that feed the lushness of the equatorial rain forest. The now-dry air high in the troposphere spreads laterally north or south. When this air reaches latitudes of 20 to 30 C, a region called the subtropics, it has become cold and dense enough to sink. Because the air is dry, no clouds form, and intense solar radiation strikes the Earth’s surface. The sinking, dry air becomes denser and heats up, soaking up any moisture present. In the regions swept by this hot air on its journey back to the equator, evaporation rates greatly exceed rainfall rates, so the land becomes parched. Deserts formed in rain shadows: As air flows over the sea toward a coastal mountain range, the air must rise (Fig. 17.3). As the air rises, it expands and cools. The water it contains condenses and falls as rain on the seaward flank of the mountains, nourishing a coastal rain forest. When the air finally reaches the inland side of the mountains, it has lost all its moisture and can no longer provide rain. As a consequence, a rain shadow forms, and the land beneath the rain shadow becomes a desert. A rain-shadow desert can be found east of the Cascade Mountains in the state of Washington. The formation of a rain-shadow desert. Moist air rises and drops rain on the coastal side of the range. By the time the air has crossed the mountains, it is dry. Coastal deserts formed along cold ocean currents: Cold ocean water cools the overlying air by absorbing heat, thereby decreasing the capacity of the air to hold moisture. For example, the cold Humboldt Current, which carries water northward from Antarctica to the western coast of South America, cools the air that blows east, over the coast. The air is so dry when it reaches the coast that rain rarely falls on the coastal areas of Chile and Peru. As a result, this region hosts a desert landscape, including one of the driest deserts in the world, the Atacama (figure below a, b). Portions of this narrow desert received no rain at all between 1570 and 1971. Deserts formed in the interiors of continents: As air masses move across a continent, they lose moisture by dropping rain, even in the absence of a coastal mountain range. Thus, when an air mass reaches the interior of a broad continent, it has become so dry that the land beneath becomes arid. The largest present-day example of such a continental-interior desert, the Gobi, lies in central Asia. Deserts of the polar regions: So little precipitation falls in Earth’s polar regions (north of the Arctic Circle and south of the Antarctic Circle) that these areas are, in fact, arid. Polar regions are dry, in part, for the same reason that the subtropics are dry (the global pattern of air circulation means that the air flowing over these regions is dry), and in part, for the same reason that coastal areas along cold currents are dry (cold air holds little moisture). The formation of a coastal desert. 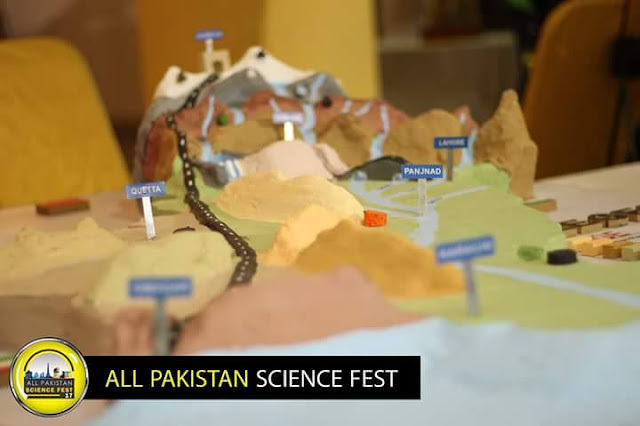 Different regions of the land surface have become deserts at different times in the Earth’s history, because plate movements change the latitude of landmasses, the position of landmasses relative to the coast, and the proximity of landmasses to a mountain range. Because of plate tectonics, some regions that were deserts in the past are temperate or tropical regions now, and vice versa. In 1799, as legend has it, a hunter by the name of Houchins was tracking a bear through the woods of Kentucky when the bear suddenly disappeared on a hillslope. Bafﬂed, Houchins plunged through the brambles trying to sight his prey. Suddenly he felt a draft of surprisingly cool air ﬂowing down the slope from uphill. Now curious, Houchins climbed up the hill and found a dark portal into the hillslope beneath a ledge of rocks. Bear tracks were all around was the creature inside? He returned later with a lantern and cautiously stepped into the passageway. After walking a short distance, he found himself in a large, underground room. Houchins had discovered Mammoth Cave, an immense network of natural tunnels and subterranean chambers a walk through the entire network would extend for 630 km. Most large cave networks develop in limestone bedrock because limestone dissolves relatively easily in corrosive groundwater. 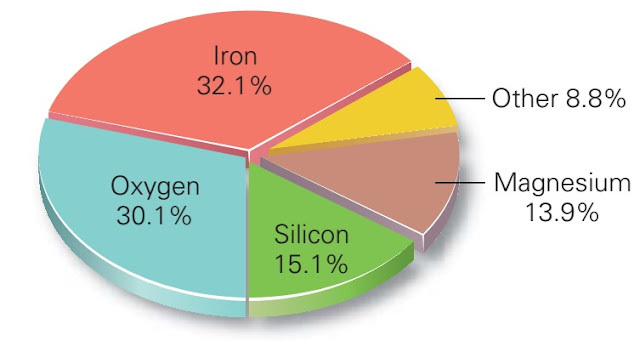 Generally, the corrosive component in groundwater is dilute carbonic acid (H2CO3), which forms when water absorbs carbon dioxide (CO2) from materials, such as soil, that it has passed through. 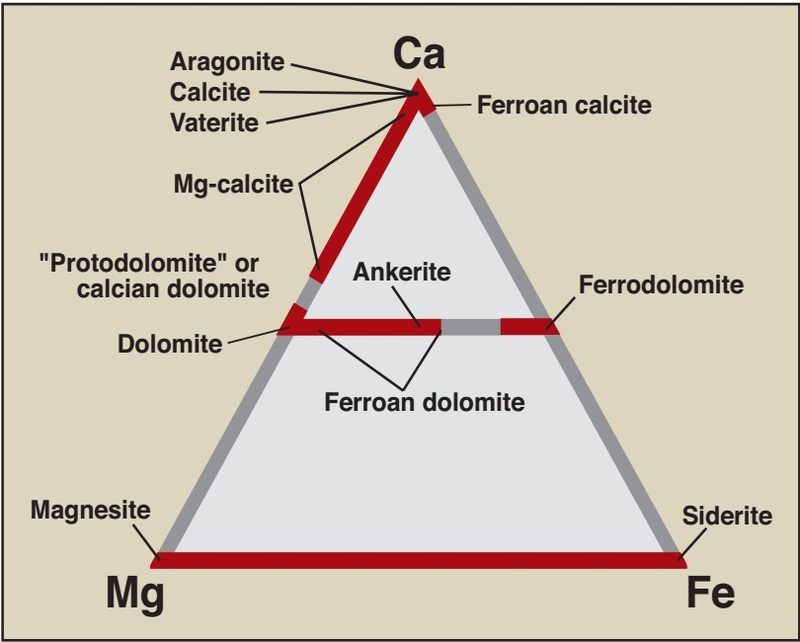 When carbonic acid comes in contact with calcite (CaCO3) in limestone, it reacts to produce HCO31- and Ca2 ions, which then dissolve. In recent years, geologists have discovered that about 5% of limestone caves around the world form due to reactions with sulfuric-acid-bearing water Carlsbad Caverns in New Mexico serves as an example. Such caves form where limestone overlies strata containing oil, because microbes can convert the sulfur in the oil to hydrogen sulﬁde gas, which rises and reacts with oxygen to produce sulfuric acid, which in turn eats into limestone and reacts to produce gypsum and CO2 gas. Geologists debate about the depth at which limestone cave networks form. Some limestone dissolves above the water table, but it appears that most cave formation takes place in limestone that lies just below the water table, for in this interval the acidity of the groundwater remains high, the mixture of groundwater and newly added rainwater is not yet saturated with dissolved ions, and groundwater ﬂow is fastest. The association between cave formation and the water table helps explain why openings in a cave network align along the same horizontal plane. Development of karst, dripstone and flowstone. As we have noted, caves in limestone usually occur as part of a network. Cave networks include rooms, or chambers, which are large, open spaces sometimes with cathedral-like ceilings, and tunnel-shaped or slot-shaped passages. Some chambers may host underground lakes, and some passageways may serve as conduits for underground streams. The shape of the cave network reﬂects variations in permeability and in the composition of the rock from which the caves formed. Larger open spaces developed where the limestone was most soluble and where groundwater ﬂow was fastest. Thus, in a sequence of strata, caves develop preferentially in the more soluble limestone beds. Passages in cave networks typically follow pre-existing joints, for the joints provide secondary porosity along which groundwater can ﬂow faster (figure above a). Because joints commonly occur in orthogonal systems (consisting of two sets of joints oriented at right angles to each other), passages may form a grid. When the water table drops below the level of a cave, the cave becomes an open space ﬁlled with air. In places where downward percolating groundwater containing dissolved calcite emerges from the rock above the cave and drips from the ceiling, the surface of the cave gradually changes. As soon as this water re-enters the air, it evaporates a little and releases some of its dissolved carbon dioxide. As a result, calcium carbonate (limestone) precipitates out of the water and produces a type of travertine. The various intricately shaped formations that grow in caves by the accumulation of dripstone are called speleothems. Cave explorers (spelunkers) and geologists have developed a detailed nomenclature for different kinds of speleothems (figure above b). Where water drips from the ceiling of the cave, the precipitated limestone builds dripstone. Initially, calcite precipitates around the outside of the drip, forming a delicate, hollow tube called a soda straw. But eventually, the soda straw ﬁlls up, and water migrates down the margin of the cone to form a more massive, solid icicle-like cone called a stalactite. Where the drips hit the ﬂoor, the resulting precipitate builds an upward-pointing cone called a stalagmite. If the process of dripstone formation in a cave continues long enough, stalagmites merge with overlying stalactites to create travertine columns. In some cases, groundwater ﬂows along the surface of a wall and precipitates to produce drape-like sheets of travertine called ﬂowstone (figure above c). The travertine of caves tends to be translucent and, when lit from behind, glows with an eerie amber light. Limestone bedrock underlies most of the Kras Plateau in Slovenia, along the east coast of the Adriatic Sea. The name kras, which means rocky ground, is apt because this region includes abundant rock exposures (figure above a). Geologists refer to regions such as the Kras Plateau, where surface landforms develop when limestone bedrock dissolves both at the surface and in underlying cave networks, as karst landscapes or karst terrains from the Germanized version of kras. Karst landscapes typically display a number of distinct landforms. 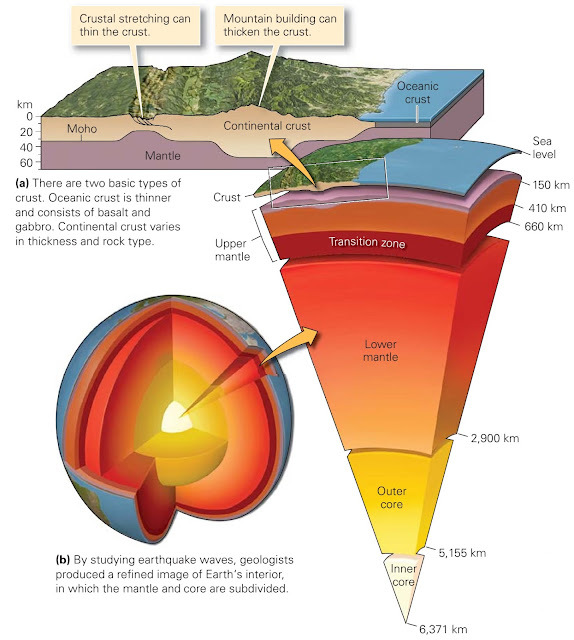 Perhaps the most widespread are sinkholes, circular depressions that form either when the ground collapses into an underground cave below (as we discussed early in this chapter) or when surface bedrock dissolves in acidic water on the ﬂoor of a bog or pond. Not all of the caves or passageways beneath a karst landscape have collapsed, and this situation leads to unusual drainage patterns. 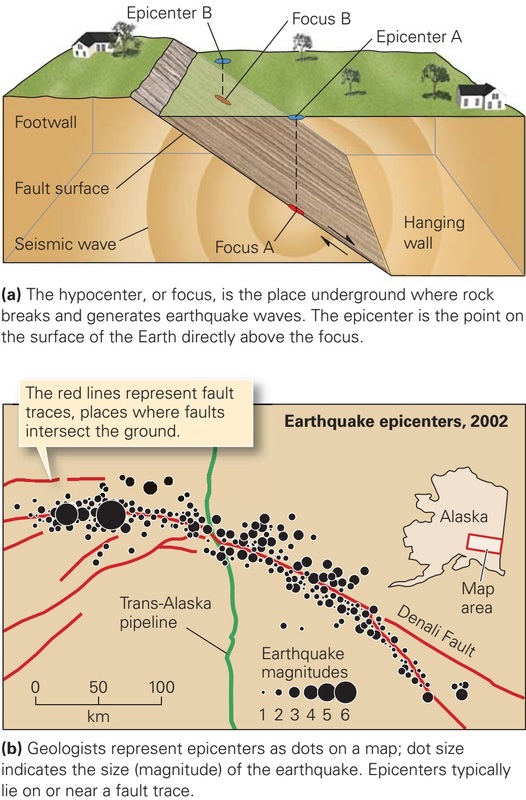 Speciﬁcally, where surface streams intersect cracks (joints) or holes that link to caverns or passageways below, the water cascades downward into the subsurface and disappears (figure above b). Such disappearing streams may ﬂow through passageways underground and re-emerge from a cave entrance downstream. In cases where the ground collapses over a long, joint-controlled passage, sinkholes may be elongate and canyon-like. Remnants of cave roofs remain as natural bridges. Ridges or walls between adjacent sinkholes tend to be steep-sided. Over time, the walls erode, leaving only jagged, isolated spires a karst landscape dominated by such spires is called tower karst. The surreal collection of pinnacles constituting the tower karst landscape in the Guilin region of China inspired generations of artists who portray them on scroll paintings (figure below). Tower karst forms a spectacular landscape in southern China. 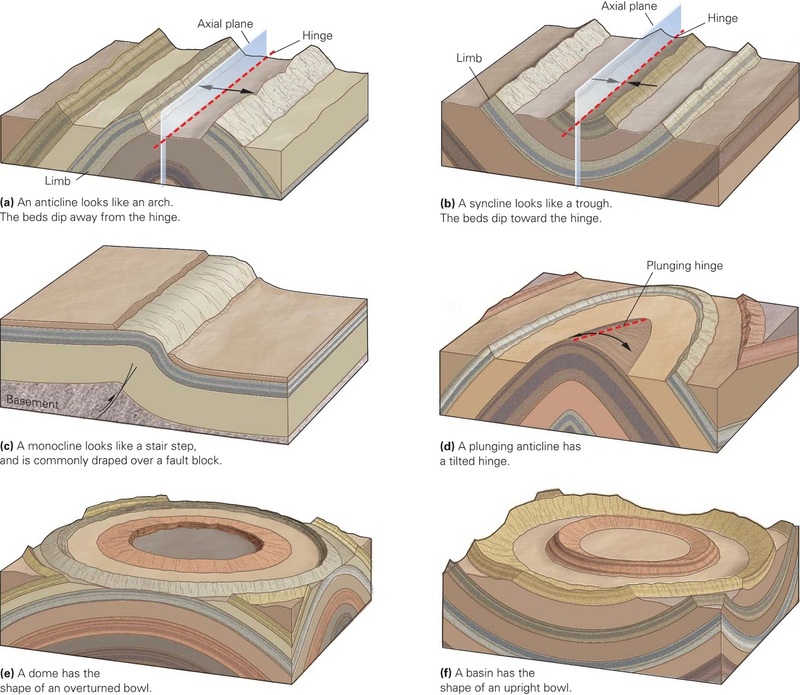 Karst landscapes form in a series of stages (figure below a–c). The progressive formation of caves and a karst landscape. The establishment of a water table in limestone: The story of a karst landscape begins after the formation of a thick interval of limestone in which the water table lies underground. 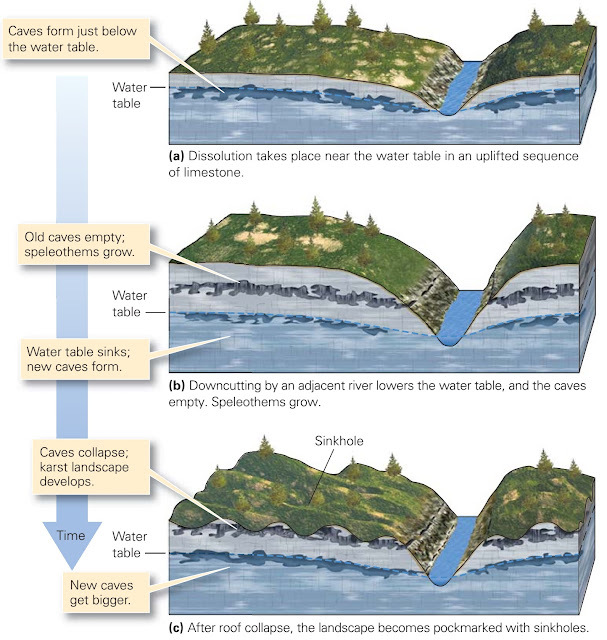 The formation of a cave network: Once the water table has been established, dissolution begins and a cave network develops. A drop in the water table: If the water table later becomes lower, either because of a decrease in rainfall or because nearby rivers downcut and drain the region, newly formed caves dry out. Downward-percolating water emerges from the roofs of the caves; dripstone and flowstone precipitate. Roof collapse: If rocks fall off the roof of a cave for a long time, the roof eventually collapses. Such collapse creates sinkholes and troughs, leaving behind hills, ridges, and natural bridges. Despite their lack of light, caves are not sterile, lifeless environments. Caves that are open to the air provide a refuge for bats as well as for various insects and spiders. Similarly, ﬁsh and crustaceans enter caves where streams ﬂow in or out. Species living in caves have evolved some unusual characteristics. For example, cave ﬁsh lose their pigment and in some cases their eyes. Recently, explorers discovered caves in Mexico in which warm, mineral-rich groundwater currently ﬂows. Colonies of bacteria metabolize sulphur-containing minerals in this water and create thick mats of living ooze in the complete darkness of the cave. Long gobs of this bacteria slowly drip from the ceiling. Because of the mucus-like texture of these drips, they have come to be known as “snotites”.